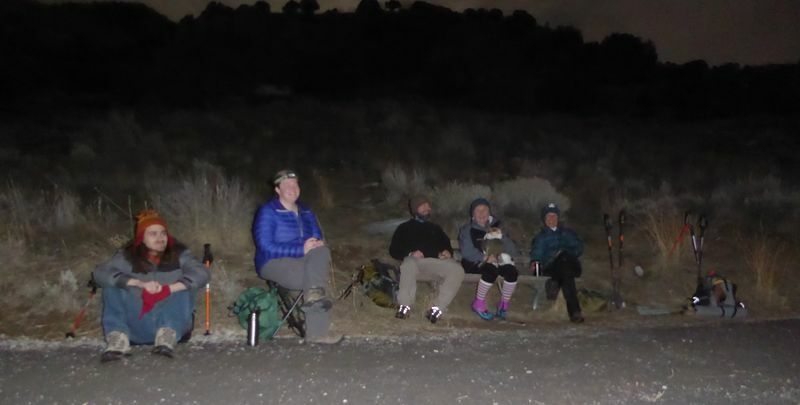 Six Cache Hikers experienced a blue moon/super moon event on the Bonneville Shoreline Trail. Jane, Jeff, Maggie, Brandon, Monika and Dave W., the leader, and Fritzi the dog. Originally scheduled as a ski/snowshoe activity, boots were the obvious choice due to the lack of snow and warm temperatures of this unusual winter season. Although the trail surface was about half muddy dirt, trekking poles were useful accessories due to icy snow on the rest of the trail. We met at 7:00 p.m. on this Tuesday evening and drove to Green Canyon and the parking area at the Bonneville Shoreline Trailhead. Cloudy skies prevented a clear view of the moon but there still was plenty of light to see our way along the trail. 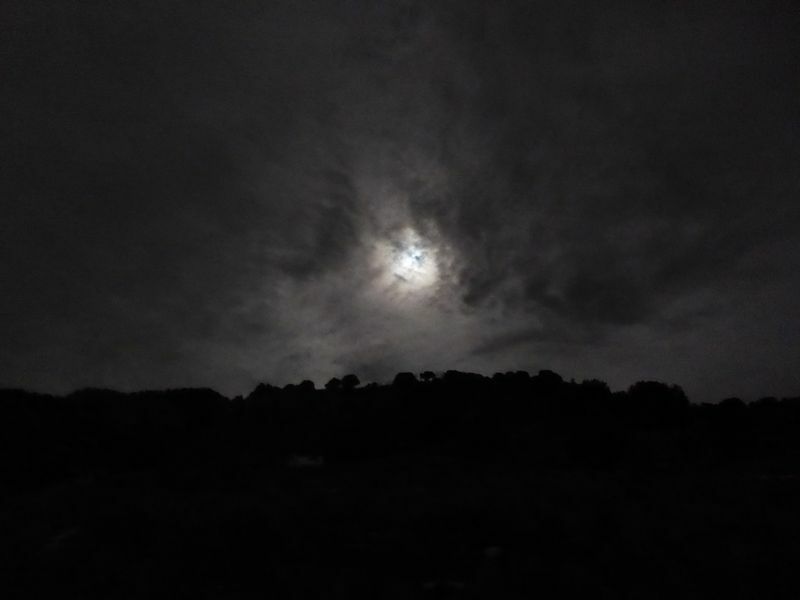 We enjoyed views of the lights of Logan below as we strolled along the trail before stopping at a trailside bench for a snack break where Jane shared "moon cookies" with everyone. After our break we continued another 1/3 mile or so to the spot where a small but picturesque tree grows from a trailside rock. We returned the same way we came, illuminated only by the moonlight diffusing through the clouds. We returned to Logan shortly after 10:00. 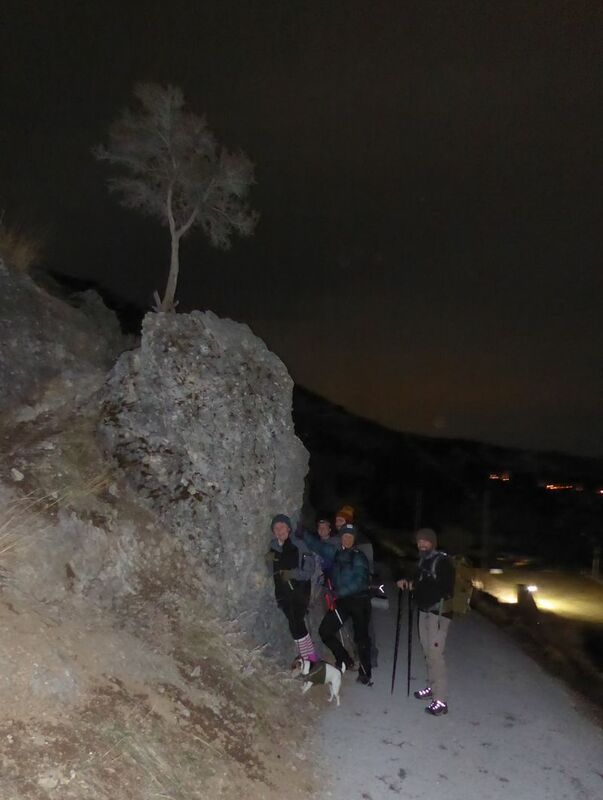 Note: We scheduled this trip on the day before the date of actual full moon so the moon would be visible above the mountains to the east as we hiked. Illumination was 99% of the maximum on this evening (a lunar eclipse occurred about 6:00 a.m. the next morning but it was not visible due to a heavy cloud cover). Thanks to Dave W. for the narrative and photos and Jane for the GPS data.